^ McCafferty, Ryan (21 December 2016). "FULL THROTTLE REMASTERED: TIM SCHAFER ON BRINGING HIS BEST-SELLING ADVENTURE GAME BACK – IGN FIRST". IGN. Retrieved 26 December 2017. ^ Purslow, Matt (24 August 2017). "Narrative games aren't oversaturated, but they're in danger of stagnating". PCGamesN. Retrieved 24 August 2017. ^ James Pickard (26 September 2016). "Talking 'walking sims': The Chinese Room's Dan Pinchbeck on the pointlessness of the debate". PCGamesN. Retrieved 18 May 2018. ^ Clark, Nicole (11 November 2017). "A brief history of the "walking simulator," gaming's most detested genre". Salon. Retrieved 15 August 2018. ^ Heron, Michael (3 August 2016). "Hunt The Syntax, Part One". Gamasutra. Archived from the original on 1 August 2016. Retrieved 3 August 2016. ^ Lane, Rick (20 July 2017). 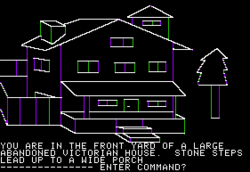 "How Maniac Mansion's verb-object interface revolutionised adventure games". PC Gamer. Retrieved 20 July 2017. ^ a b Manuel, Rob (5 February 2013). 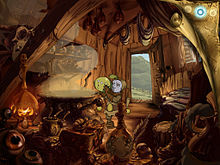 "How adventure games came back from the dead". PC World. Archived from the original on 21 July 2016. Retrieved 3 August 2016. ^ "www.oldgames.sk :: Časopisy BiT, Excalibur, Score, Riki". www.oldgames.sk. Retrieved 3 February 2019. ^ פרוינד, ע"י גד (18 November 2018). "פיפוש 2018: ראיון בלעדי עם יוצרי המשחק החדש". IGN Israel (in Hebrew). Retrieved 3 February 2019. ^ "Hellboy Director Talks Gaming – Edge Magazine". Next-gen.biz. 26 August 2008. Archived from the original on 12 August 2010. Retrieved 27 October 2011. This page is based on the Wikipedia article Adventure game; it is used under the Creative Commons Attribution-ShareAlike 3.0 Unported License (CC-BY-SA). You may redistribute it, verbatim or modified, providing that you comply with the terms of the CC-BY-SA.